Thursday December 17th 1925 I went down town for more cards, put in the day visiting. Letters and cards to Frank Woolf, Blanche Abernathy, Col Eggleston, Rie Sanford, Tishie Hedges, The Pickens, The Lowes, Stella Webster, Walter Falk, Jim Dunlap, Mrs O'Leary. Cards to Harry Mason & Don McDougall. We went down town early for Ott. Then out to Ruths for birthday party. 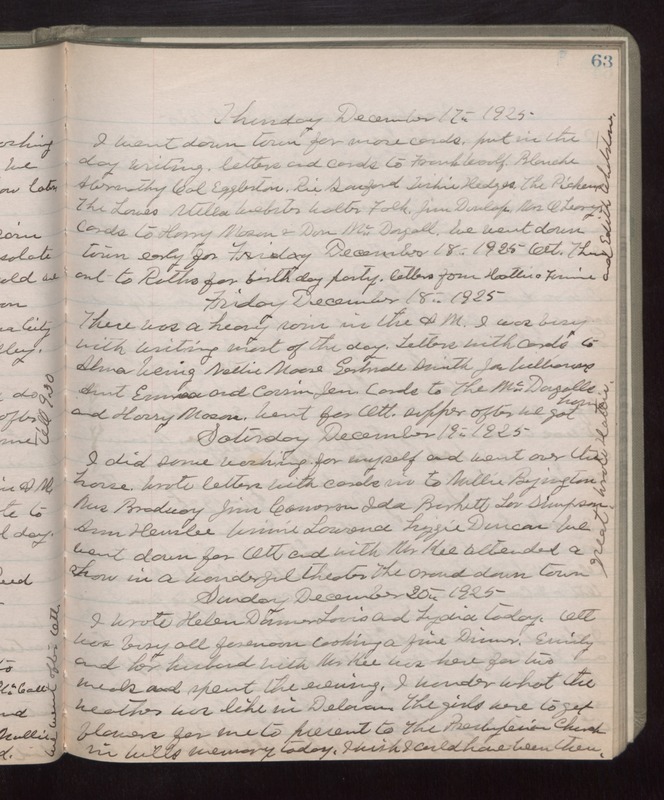 Letters from Hattie & Fannie and Edith Whetstone. Friday December 18th 1925 There was a heavy rain in the AM. I was busy with writing most of the day. Letters with cards to Alma Wenig, Nettie Moore, Gertrude Smith, Joe Williams, Aunt Emma and Cousin Jen. Cards to The McDougalls and Harry Mason. Went for Ott. Supper after we got home. Saturday December 19th 1925 I did some washing for myself and went over the house. Wrote letters with cards in to Millie Byington, Mrs Bradway, Jim Carnavan, Ida Burkett, Lou Simpson, Anne Henslee, Winnie Lowrence, Lizzie Duncan. We went down for Ott and with Mr Kee attended a show in a wonderful theater. The crowd down town great. Wrote Hattie. Sunday December 20th 1925 I wrote Helen Danner Louis and Lydia today. Ott was busy all forenoon cooking a fine dinner. Emily and her husband with Mr Kee was here for two meals and spent the evening. I wonder what the weather was like in Delavan. The girls were to get flowers for me to present to The Presbyterian Church in Wills memory today. I wish I could have been there.